We have taken our clients’ weddings, corporate parties, birthday parties, and more and turned them into experiences that their guests will never forget. 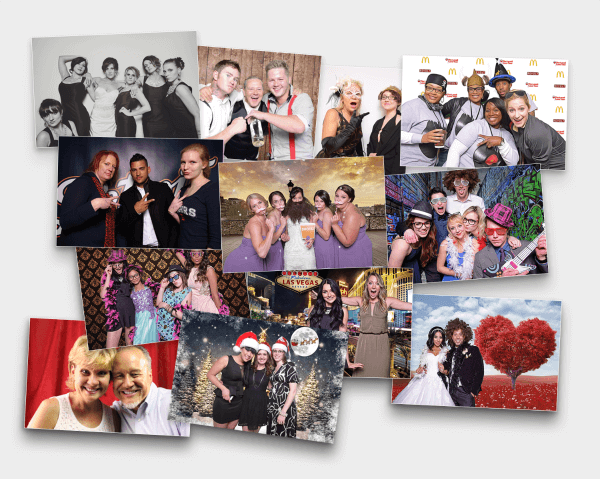 Take a look at what they’ve had to say about FotoBomb Photo Booths and imagine the possibilities for your next event! My family used the photo booth for my son's wedding and it was awesome!!! Everyone took multiple pictures and the guests had an awesome time using it. Everyone received a picture to take with them along with a text taking you to the website. The bride and groom also received a photo album with copies of all the pictures. There were four different backgrounds to choose from which made it fun too! Erika was wonderful. She made sure that everyone got their pictures and was great to work with. I would recommend them to everyone!!! * Rowena G.
I recently used FotoBomb for my wedding at the Gem Theatre downtown and they were awesome. Claire did a wonderful job and my guests really enjoyed being able to take photos. They have a really cool feature where you can send the photo strip to your phone and get a printed copy. Thank you Fotobomb for helping make my wedding a great experience for my guests! * Lauren T.
FotoBomb provided a photo booth for the company holiday party and it was a lot of fun! The photo quality was amazing and the text feature was awesome. I would highly recommend this company! * Jay S.
Just had the MOST amazing experience with FotoBomb at the Lauren and Chris Thomas wedding! So friendly and the pics turned out hilariously, can’t wait to use them for an event in the future. A++++!! * Elizabeth P.
Very happy we chose FotoBomb for our wedding! People had a blast all night and Claire was awesome to work with. We absolutely recommend them! * Chris T.
This company believes in quality! Very pleased with how nice our photos turned out with forobomb at a Christmas event we attended. Thumbs up! * Megan S.
Great experience and great props! Also, loved that we were able to text ourselves our pictures. * Jessica W.
Great Service, The picture quality was nice and the photo booth attendant Erika was super nice and outgoing. I would definitely use them again. * Peggy Z. Great addition to a wedding! They are a lot of fun. * Lyle T.
They have Top-of-the-Line (Read: New & Expensive) equipment including a Green Screen Option, which I HIGHLY recommend adding! Open Air Photo Booths can accommodate large numbers of people, all in the same pictures, and each guest is provided with their photo along with the option for digital copies. The Photo Booth was really fun and the quality was great. Our guests had a great time and really enjoyed the social media aspect of the photo booth. I would Highly recommend using fotobomb* Becky A. Hired for my wedding. Service was excellent! Looking back after the wedding, this was the best investment that we made. The guests also had a blast! I would recommend FotoBomb for any event. * Russell G.
I don't usually leave reviews, but I am totally blown away by Eric and the team at FotoBomb. We hired them for a corporate event with about 220 attendees of all ages. Everyone loved the booth and we got a bunch of great shots. And bonus? We have full rights to the digital files. We will definitely be renting another booth in the future. Thanks guys! * Benjamin H.
FotoBomb was hired by my work to provide a booth for our company Christmas party. Normally I don't get into photo booths too much but the staff was very welcoming and willing to work with me and my attempts to be funny with the pictures. They have dozens of props to put on yourself and I was easily able to find things that suited my personality. I ended up spending a lot of time going through the booths with different groups of co-workers and it was a highlight of the night. I've since kept the photo strips at my desk at work and even now. several months later they are still frequently noticed. A nice conversation starts up and we recall the memories from that great night. FotoBomb definitely made all that possible. Thank you so much! * Sean M.
I was on the hunt for a great company with great quality and great prices and I surely found it! I had the perfect experience! Great quality and was very very happy with the rental! Had no issues what so ever and the quality was phenomenal! I had all of my guests asking where I got the booth from! And they all loved it! There was a awesome feature where you could text yourself the picture right from the booth! Totally worth it! Highly recommend! * Lainey E.
Fotobomb is such a great company! They are very professional and fun and they have great prices compared to a lot of other vendors. I was very pleased with their service and would absolutely recommend them to anyone. They do a fantastic job of staying in contact before, during, and after the event to follow up. Their photos are great quality and they have tons of great props. Such a great addition to a party! * Ellen K.
FotoBomb was so easy to work with and did an amazing job at my wedding. All of my guests loved the photo booth, the props, and their pictures. I didn't make it into the photo booth, but my husband loved it and I truly enjoyed getting a memory book and a flash drive of all of the pictures. I would recommend FotoBomb to anyone! * Maria K.
After much thought and consideration i decided on FotoBomb to cover my event. I have to say that was one of the best decisions i have made. From the very beginning they answered my phone calls immediately and really treated me like i was their #1 priority. I would recommend Fotobomb to anyone for any occasion no matter how big or small. * Nathan M.
Just used FotoBomb Photo Rental last Friday for my daughters graduation party, and it was a great choice!! Everyone had a fantastic time and and made sure to tell us! We filled up our memory book pretty good as well! Everything went very smoothly and messages were returned immediately. Our attendant Rebecca was Fabulous!! She was super sweet, knew exactly what she was doing, and interacted great with everyone! (especially, all the little kids-who ran up a 1000 times lol). Would definitely recommend FotoBomb to everyone and have already referred Rebecca for a friends party! THANKS, for helping make our party great! * Jennifer V.
We loved the Photo booth. It was very elegant and spacious. Quick Responses from the vendor and they made everything easy. We loved the video option as we got to laugh the following day when we got to watch all of them. * Tracey A.
FotoBomb provided excellent quality pictures and video with a professional yet fun attitude. Props were fun and helped make my cousins wedding memorable. I will be using them at our next event and will suggest them to others. * John W.
Fotobomb ran the photo booth at my company's holiday party, they did an excellent job and offered some really creative services I haven't seen done by other booths! * Andy B. Everything worked out perfectly and I highly recommend Fotobomb. This was the first time we have had an experience with a rented photo booth and couldn't have been more pleased. Great photo booth and great staff. * Mark K.
The photo booth was so much fun and the workers were great and respectful. Everyone had a great time and we loved seeing all the photos! * Audrey M.
Great photo booth rental, everyone enjoyed it at the wedding reception. Loads of fun and very respectful owners. Definitely recommended. * D.K. FotoBomb Went over and beyond with the service they provided for our wedding. We loved the pictures and the fact we were able to share all the photos with our friends through the hosted gallery was amazing. * Ryan I. This is a business run by a veteran U.S.soldier who fought in Iraq. He and his wife are a very intelligent, reliable and hardworking couple raising their young family in the Downriver area. These are the type of people I prefer to do business with. I will definitely be using this service when I need a photobooth at my next Class Reunion. * Kathleen M.
This Photo booth was at our company party. They have a great selection of props, the workers were very friendly and approachable, and everyone had a great time! I will use FotoBomb for any party I need a Photo Booth in the future! * Eric D.
We looked for a photo booth for months and we decided to go with Fotobomb to host an event for a Fallen Fire Fighter. We were absolutely blown away with the service and the photos turned out great! Tons of props and friendly workers* Eric M.
The people at FotoBomb were really friendly. Everyone had a great time and the photo quality was great. * Thuy N.
Perfect! The Photo Booth Rental was great and the guest really enjoyed the size and selection of props. I Highly recommend FotoBomb* Matthew B. Great photobooth rental, great price and very professional. Everyone loved it! * Ralph M.
Fantastic experience, booth is easy to use and fun. The service that comes with the booth is 5 star !!!! * Brett S.